OsirisOrion brings his visceral creations together in one exhibit at David Apuzzo's Photography & Art Gallery in Hamden, CT on Jan. 22 2010. 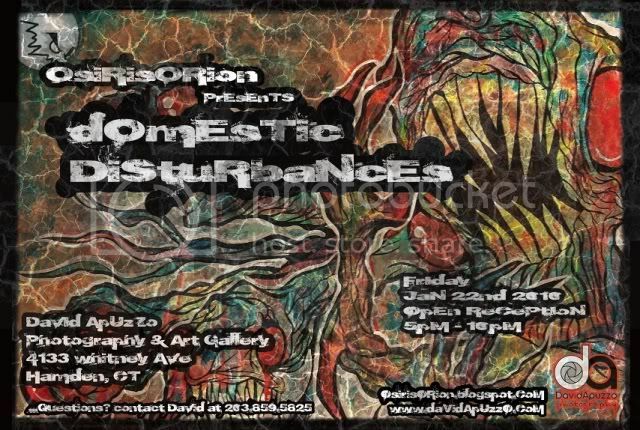 Domestic Disturbances has been in the works for 2 years and will display over 15 new paintings numerous custom toys and original sculpts featuring OsirisOrion's signature visceral surrealist style. 2 limited edition poster prints will be available also.